Today is the big day you’ve all been waiting for – the One Room Challenge Guest reveals! 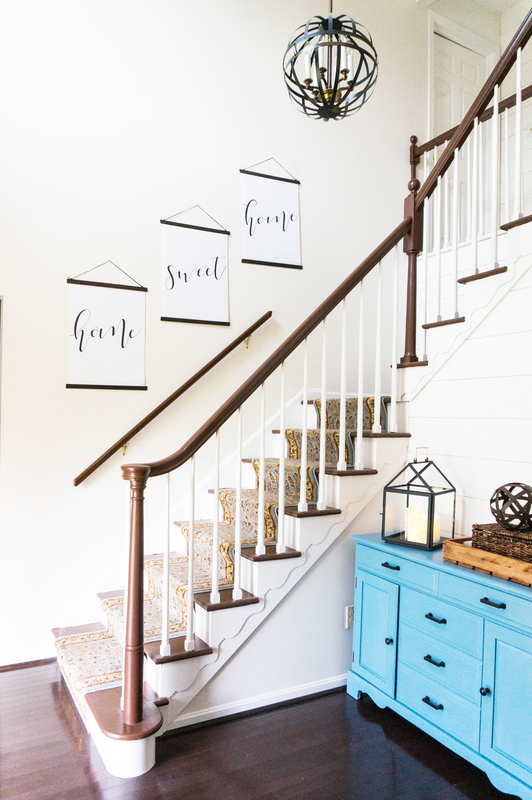 I am so excited to be sharing my revamped entryway with all of you. And I can’t wait to see all of the other One Room Challenge Reveals over at Calling it Home. 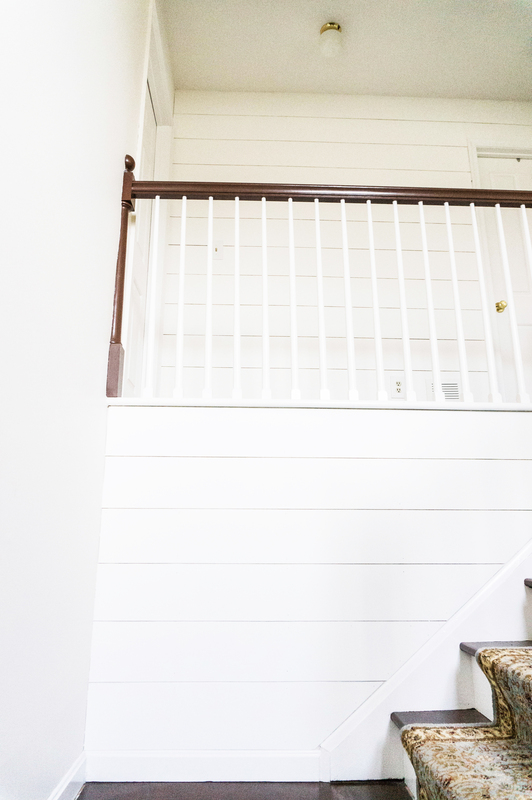 If you’re a lover of shiplap, I think you’ll fall for our foyer renovation. 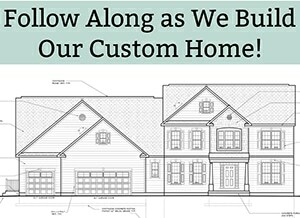 We channeled our inner Chip & Joanna to bring a little bit of farmhouse to our 1980’s colonial. 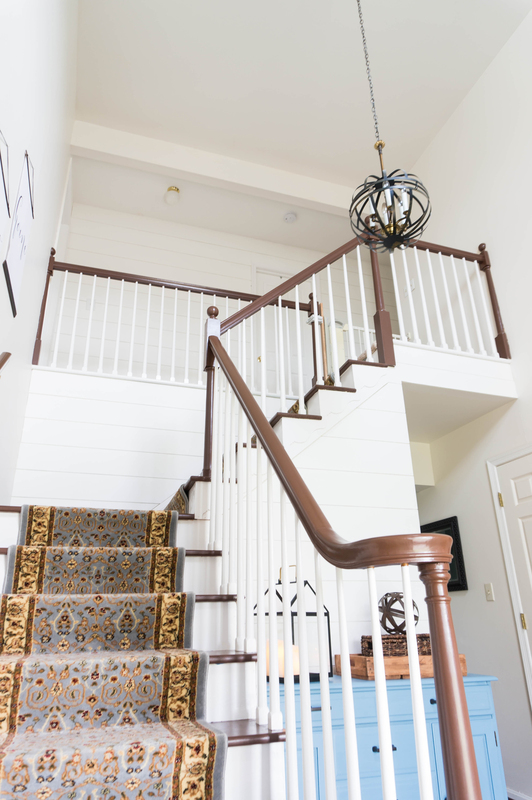 So without further ado, here is our redesigned foyer! I wanted a basket to help store all of the “stuff” that always ends up on top of furniture in the foyer. I know we can’t be the only ones that end up with a pile of “stuff” in their foyer. The odd spindles you see at the top of the stars are our baby gate. Notice my small helper in the pink sweater? 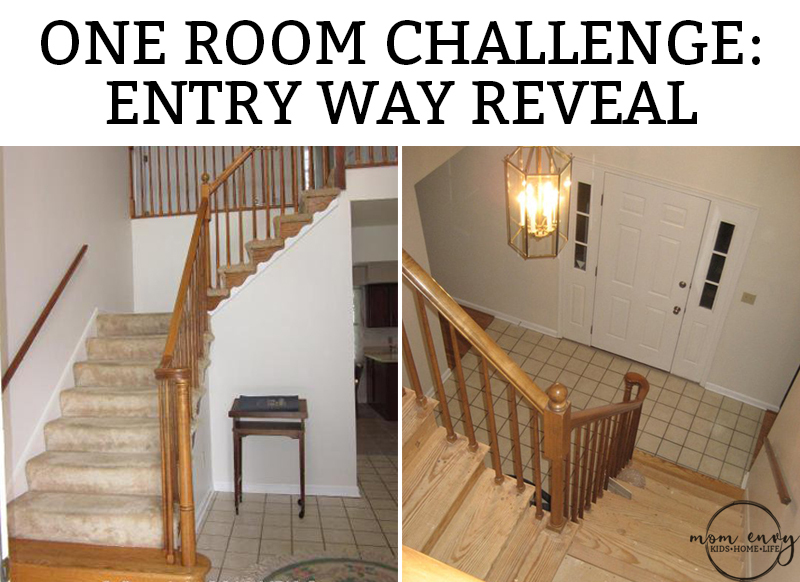 For more reveals, don’t forget to head over Calling it Home’s One Room Challenge page. You can find the contributors reveals as well as the guest participants. 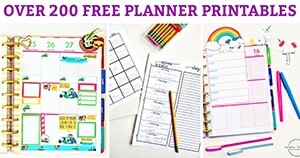 You’ll be so inspired by their creativity and design! What a bright welcoming entry! 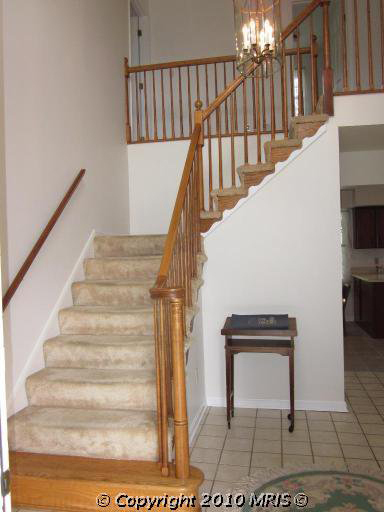 The floor and railing refinishing made an enormous difference! Thanks so much, Deb! I love all of the details in your new studio! 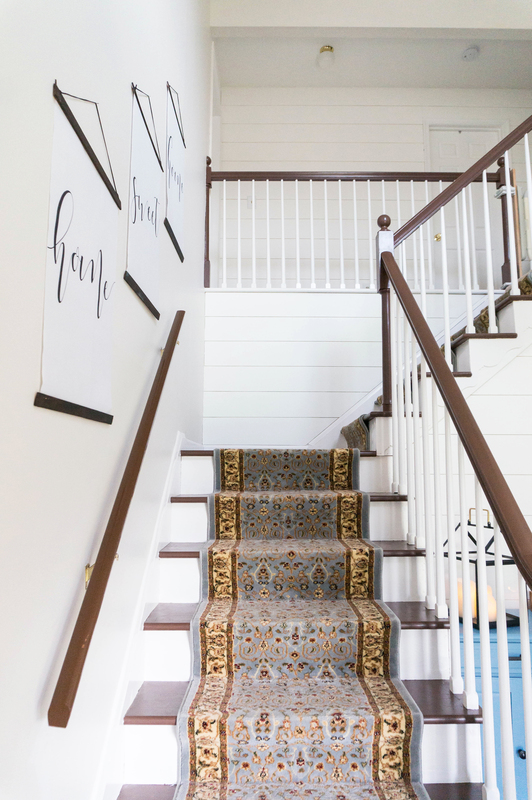 I love the runner on the stairs and the simple artwork on the walls! Thanks so much, Mary! I love your mudroom reveal. 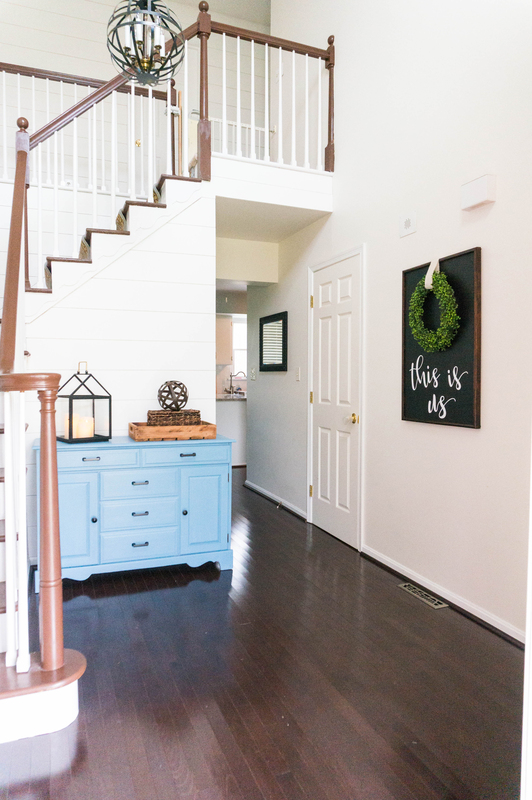 I am totally jealous that you have a mudroom space – so smart to have it at the basement entrance! WOW!!! For such a ‘simple’ space this is a HUGE transformation. The ship lap looks fantastic, and the color of the console dresser is wonderful, as are the home sweet home and this is us signs. Fantastic job, enjoy your new space! Thanks so much Michaela! I love how your sunroom turned out! I can’t believe you did that floor yourself with a stencil – I totally thought it was a tile or vinyl at first! What a gorgeous entry! 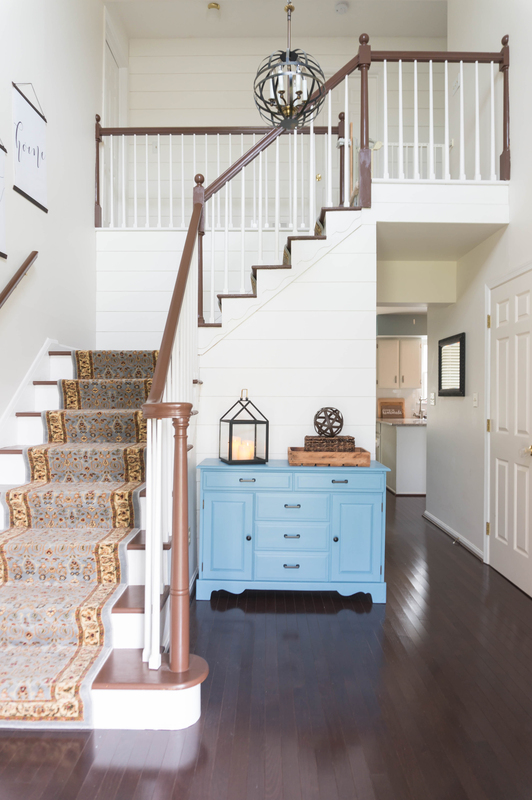 That carpet runner is beautiful – and I love that chest! Congrats on a stunning reveal! Thanks so much Jen!! Your powder room is beautiful. That fabric “wallpaper” is gorgeous!! 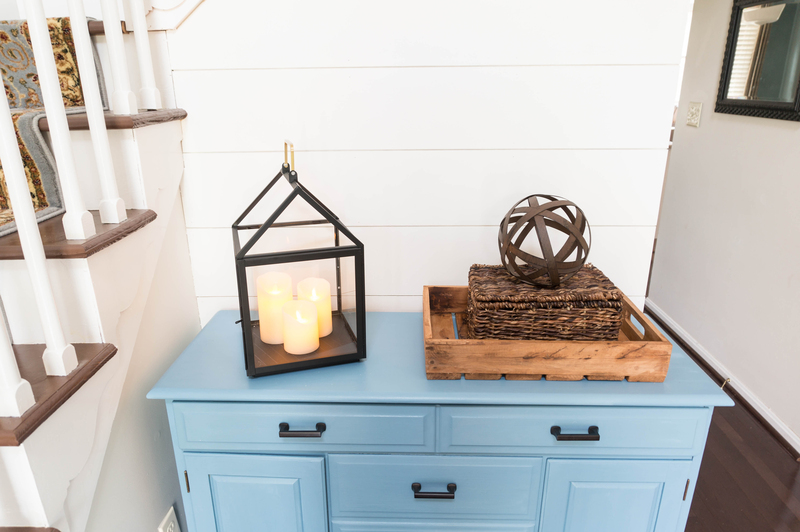 What a beautiful entryway! Love all the color. Nicely done. Thanks so much, Libbie! I LOVE your laundry room!! I have been dying to use navy blue somewhere in my house (everything I have right now is a lighter blue). Your space is beautiful! 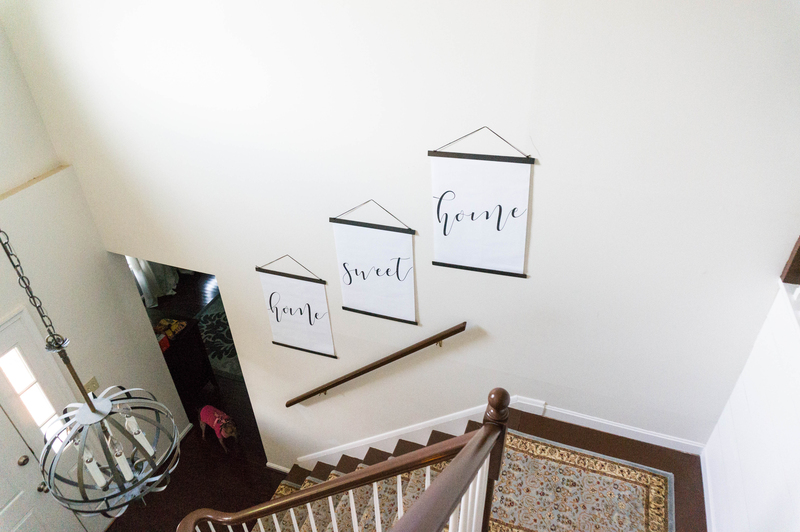 I love those banners-they are the perfect touch! 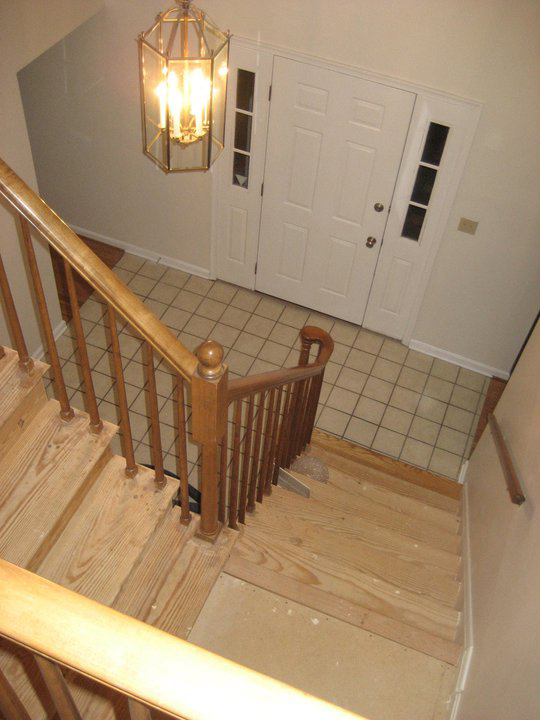 And I love that you did your foyer for ORC, it turned out beautifully! Thanks so much, Kristin! I love your son’s room that you made over. Those lights over the dresser are amazing!! 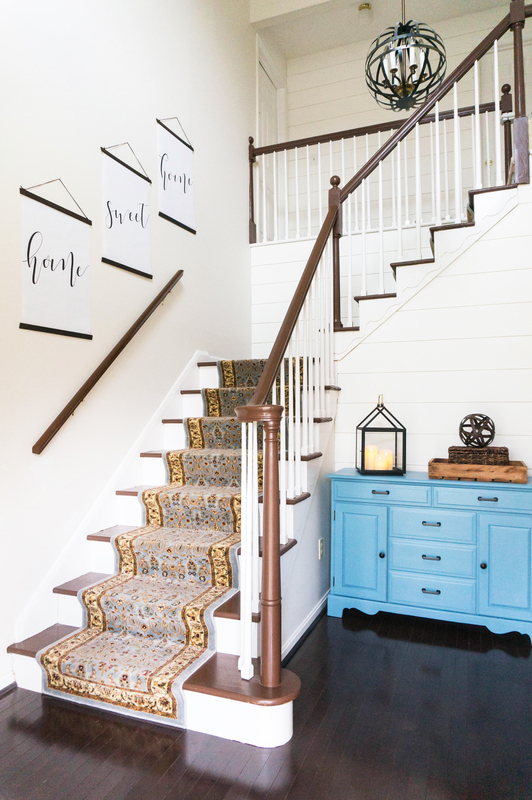 Love it Laura especially the banner and shiplap wall treatment! Congrats and Cheers for another room done! Thanks so much, Vel!! Your master looks straight out of a hotel. It is beautiful! Wow! This is really pretty! Good job! Thanks so much, Joan!! And thanks for stopping by! dresser. What a great job. I know how hard it worked — great job!!! What a transformation! I thought maybe you just moved. 😀 Seriously, you did great work. You should feel very proud. Thanks so much, Stacy!! I love your breakfast nook – what a fun space!! And that floor is beautiful! Home Pretty Home : ). The foyer looks so lovely. 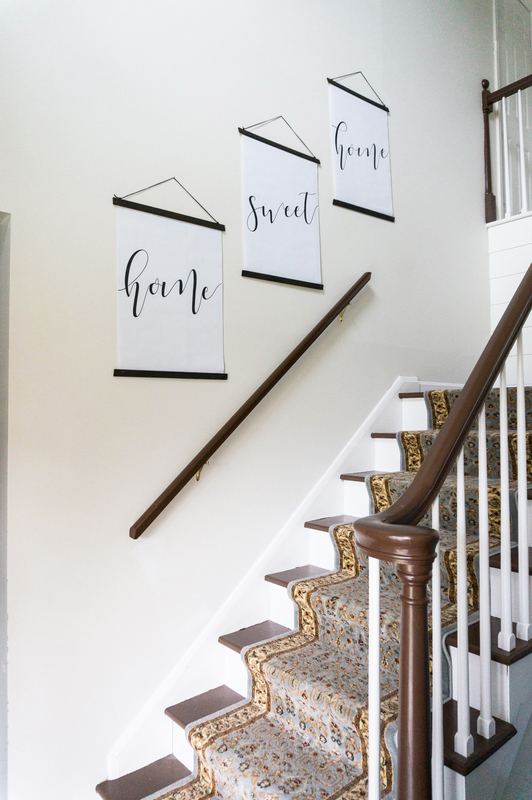 I like the signs you used and that runner really compliments the space. Great job. Thanks so much, Delia! Your guest bathroom transformation is unbelievable – it’s hard to believe it’s the same room!! this looks amazing! That is quite the transformation! Well done! Thanks so much, Mimzy! Your bathroom is gorgeous. I love the faucets for the sink! This was a super cool story to follow! 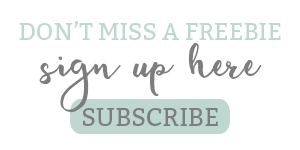 I’m not even sure how I ended up on your site but I’m glad i did! 🙂 What a great job on the remodel too, this is the first time I heard of shiplap but I’m definitely taking note of it, thanks. Great blog post! I will definitely be coming back! Laura Burton is a participant in the Amazon Services LLC Associates Program, an affiliate advertising program designed to provide a means for sites to earn advertising fees by advertising and linking to Amazon.com. Hi! Thanks for scrolling all of the way down my page. I'm Laura. 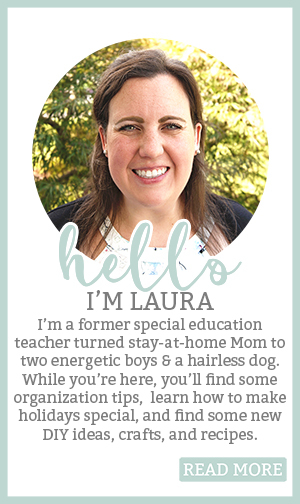 A former special education teacher turned stay-at-home. I am a Mom to two little boys and one little hairless dog. While you're here, you'll find content all about home, life, and kids. 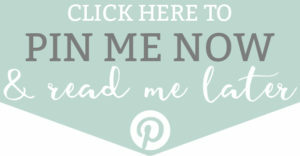 Check back frequently because I share free printables often. Thanks for stopping by!